By Michael Poh in Social Media. Updated on November 12, 2017 . In the midst of all the fun connecting with family and friends via apps, walls, and photo albums on Facebook, we sometimes forget that our privacy is vulnerable on the Net. Every time we share info about ourselves across various networks, it is revealed to everyone even though it is meant only for a select few. As a result, people or organizations outside our network could easily exploit such info about us even without us knowing. Must users be willing to pit having a healthy online social presence against a firm hold of their privacy? Not to fear though, we have here 5 privacy settings that could help you better manage your privacy while at the same time make your content-sharing experience on Facebook worry-free. Individually, they may not be able to significantly strengthen your privacy defence but adopting most or all of these settings may put your mind at ease even when you have shared more than what you wanted to. Following the footsteps of the Google+ Circles concept, Facebook has implemented an improved Friend Lists for its users in September 2011. This feature allows you to effectively customize who can see what in terms of the categories you have placed your ‘Friends’ in. Inevitably though, this means that you would need to tediously organize all your friends into different affiliation groups like Friends, Family, Colleagues, etc before it can come to effect. After you have set up your several friend lists, you can now define the privacy policies which you wish to apply to each of them. For instance, you might want to prevent your “Colleagues” friends from seeing any photos you had and will upload, but allow your “Friends” and “Family” to see them. This, along with restriction of contact details, wall posts or other updates, can be done when you tweak the settings within each group. You are also now able to put in any new friends you’ve added into whichever category you want to. One thing to note is that if you place a friend into two categories like “Colleagues” and “Friends”, your privacy setting will be set to the more restrictive category. This means that if you restrict your “Colleagues” list from seeing your photos, then this friend whom you’ve put into the two groups will follow the privacy setting of “Colleagues”. He or she will not be able to access your photos. Don’t like people to come add you to their Friend List? If you don’t list your user account into the Facebook search directory, then these people would not be able to find you there. How do you do that? Well, all you need to do is to go into your privacy settings page and click on ‘Edit Settings’ on the right of ‘How You Connect’. Once there, just switch the ‘Everyone’ to either ‘Friends of Friends’ or just ‘Friends’. It’s the equivalent of disappearing off the face of the realm of Facebook. Aside from Facebook Search, the other place some people would want to hide themselves from the public is search engines like Google, Yahoo!, etc. In fact, it makes sense for people who remove themselves from the Facebook Search directory to hide themselves from these search engines where users and non-users alike can search them by name. If you don’t want people to even have a glimpse of your Facebook profile on the Web, then you just have to click on ‘Edit Settings’ beside ‘Apps and Websites’. 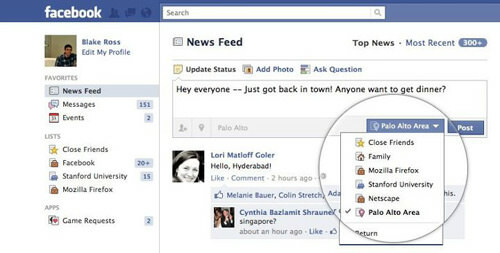 After which, edit the settings for ‘Public Search’ and you will go into a page where you have the option of seeing a preview of what others could see if they search for your Facebook account. This is also where you can simply uncheck ‘Enable public search’ and you are off the grid just like that. You can decide what you want to post on your wall, be it your most intimate secret, complaints about work or even philosophical musings. However, you can’t control what your friends want to post on your wall. Some of your friends may have a tendency to write things on your wall that you’d rather not let others see, like your relationship problems, financial troubles, etc. If you have some of these people on your list, you would be glad to know that you can customize who can see what others post on your wall. Go to your privacy settings page once again, and click on ‘Edit Settings’ beside ‘Timeline and Tagging’. There are two ways you can configure your wall posts settings. One is to restrict anyone but yourself from posting anything on your wall. For this, you should look beside ‘Who can post on your timeline’ and choose either ‘Friends’ or ‘No One’. The other one below, ‘Who can see what othres post on your timeline’, is pretty self-explanatory as well, and it affords for greater depth of customization. Many of us are aware of online companies data mining and selling our demographics and profiles to marketers. Most of us hate them. Should you be unaware of this feature, this might give you butterflies in your stomach. Instant Personalization grants certain websites access to your public profile information when you visit them. What these sites do is that they adjust their web contents to suit your wants and needs, thus creating a personalized experience. You may feel uncomfortable visiting places where such services can extract and openly use your personal information and details, even if it is to improve user experience. If you are, you can easily turn off this feature by going to the privacy settings page and click on ‘Edit Settings’ under ‘Apps and Websites’ and then ‘Edit Settings’ under ‘Instant personalization’. Just uncheck ‘Enable instant personalization on partner websites’ and get peace of mind. There are certain information which you wouldn’t want to reveal to your friends on your list under your Facebook profile page. Also, these information about you which they can see are sometimes used by apps to enhance the social experience. If you want to keep your privacy on such matters, you can select what you wish to reveal and what you don’t. 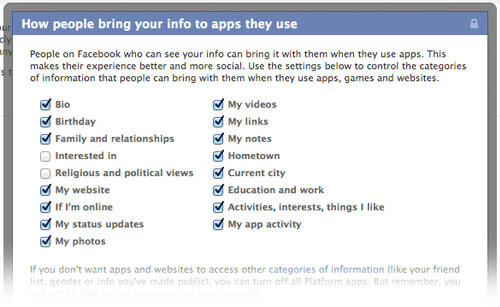 After you got into the privacy settings page, go to ‘Edit Settings’ under ‘Apps and Websites’. Next, choose ‘Edit Settings’ beside ‘How people bring info to apps they use’ and you’ll see a list of boxes of personal info categories for you to check or uncheck to indicate which are the ones you don’t mind showing. I hope that these 7 Facebook settings will help you store your private details from prying eyes. If you have other settings you know of to add to the list, sound off in the comments section below. Thanks in advance!